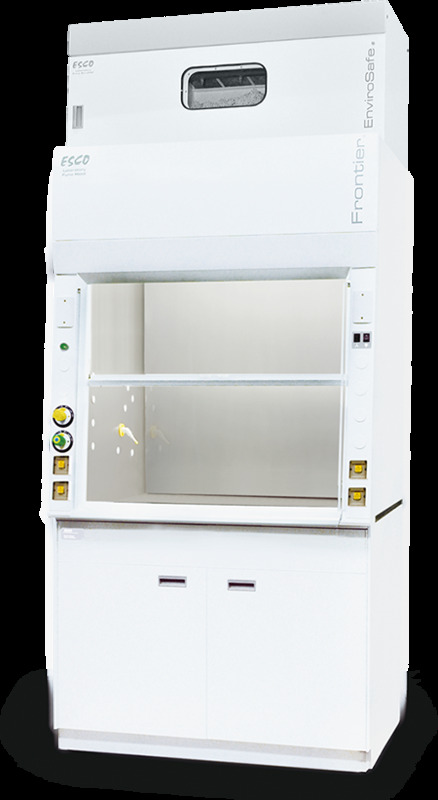 Esco Frontier Perchloric Fume Hood is designed to be used when handling hot perchloric acid, hot nitric acid, or for routine use of perchloric acid. Do not handle sulfuric acid, acetic acid, organic solvents, or any combustible materials in perchloric acid hoods. This specialized fume hood is built with stainless steel internal surfaces (including the work surface) and a wash-down system of water spray nozzles dispersed throughout the hood. When heated, perchloric acid vaporizes and condenses on hood, duct and fan components. In addition to being highly corrosive, condensed vapors can react with hood gaskets, greases and other collected materials to form explosive perchloric salts and esters. Therefore stainless steel surfaces enhance cleanability and a water wash-down removes any explosive compounds that might have formed on the internal surfaces. Disclaimer: Esco FrontierTM is UL classified. Due to the custom nature of the range, some options do not qualify for the UL label. Tri-wall construction for maximum robustness. Internal chamber constructed of grade 304 stainless steel with coved corners. Option to upgrade to grade 316 stainless steel is available. Chain and Sprocket Sash support system used. Sash key lock to allow laboratory manager to restrict access to fume hood. The sash can also be locked down in the fully closed position with the key , in the event of a fume hood fault, facility shutdown, or, simply to restrict access to equipment set up in the hood. Wash down system behind baffles to wash away any perchlorate salts deposits on the baffles to prevent any build up of the salts which are explosive in nature. Water pump system installed to ensure water pressure is constant for wash down system. The Frontier Perchloric Fume Hood is warranted for 1 year excluding consumable parts and accessories. Contact your local sales representative for specific warranty details. Each Frontier Perchloric fume hood is Ashrae tested to make sure it complies with the Ashrae 110:1995 Standards. Sash is clearly labeled with all operating instructions and illustrations. Esco offers a variety of options andaccessories to meet applicationrequirements. Base cabinetry is available for support requirements and as an additional storage area for chemicals. Base cabinetry has the option to be installed with MCB/ELCB, a fume hood circuit which helps protects laboratory equipment during sudden fluctuation of current. This circuit is only available for 230 VAC, 50/ 60 Hz hoods. Esco Envirosafe Fume Hood Scrubber for air pollution control of water soluble chemicals present in the exhaust fumes.